Workplace benefits are an important part of balancing work, family, and medical needs. Benefits such as paid family leave and sick days can help employees meet their personal and family health care needs, while also fulfilling work responsibilities. Yet there is no federal requirement for paid leave or sick days, which leaves many individuals, particularly low-income workers, to face tradeoffs such as taking time off while forgoing wages, going to work while sick, or paying for caretakers for their children and family members. This fact sheet summarizes state and local policies on paid family leave and sick days and presents new data from the 2017 Kaiser/HRET Employer Health Benefits Survey on the share of firms that offer paid parental leave and paid sick days benefits. 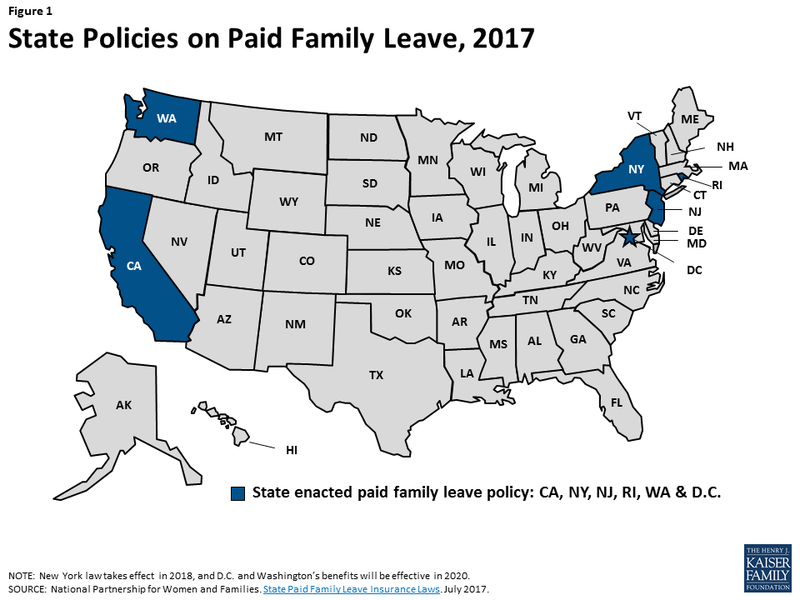 Currently, five states – California, New Jersey, New York, Rhode Island, and Washington – as well as the District of Columbia (D.C.) have enacted laws offering paid family leave (Figure 1). These states administer and fund paid leave through their own disability programs to allow some workers to care for an ill family member or bond with a child. The programs are typically supported through employee and/or employer payroll taxes, and provide partial wage replacement up to a designated cap for employees in certain firms. 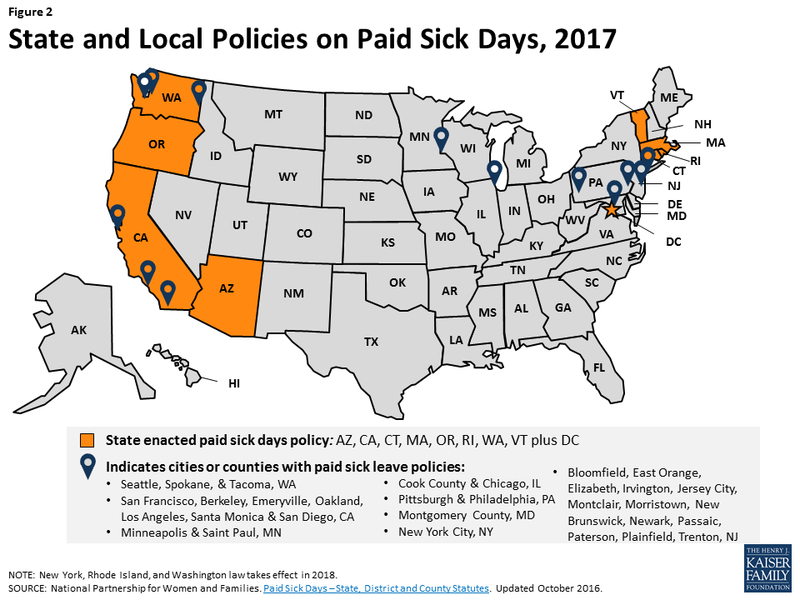 There has been more state and local traction on paid sick days policies (Figure 2). Since the first law was passed by voter initiative in 2006 in San Francisco, eight states plus D.C.,12 28 cities, and 2 counties passed laws requiring that eligible employees get paid time off to care for themselves or sick children. Several of these laws also specifically allow workers to use paid sick days for reasons related to caring for other sick family members, or in cases of sexual assault, harassment, or domestic violence. Current paid sick days laws generally work on an accrual basis, dependent on previous hours worked. The pay rate and the amount of paid sick time that can be accrued varies by policy. In the first half of 2017, the Kaiser/HRET survey 13 asked a nationally representative sample of non-federal public and private employers if they offered paid maternity and paternity leave for the birth or adoption of a child. One in three (33%) firms reported providing maternity leave and roughly half as many firms (17%) provided paternity leave. The rates are similar between large (200 or more workers) and small firms (3-199 workers) (Figure 3). 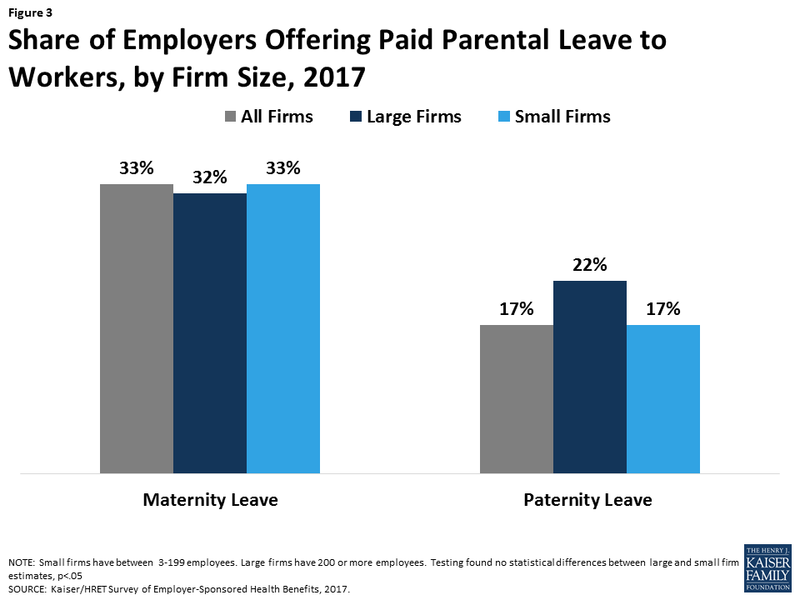 Overall, roughly one in three workers (34%) are employed in firms that offer paid maternity leave and 21% are at a firm with paid paternity leave. 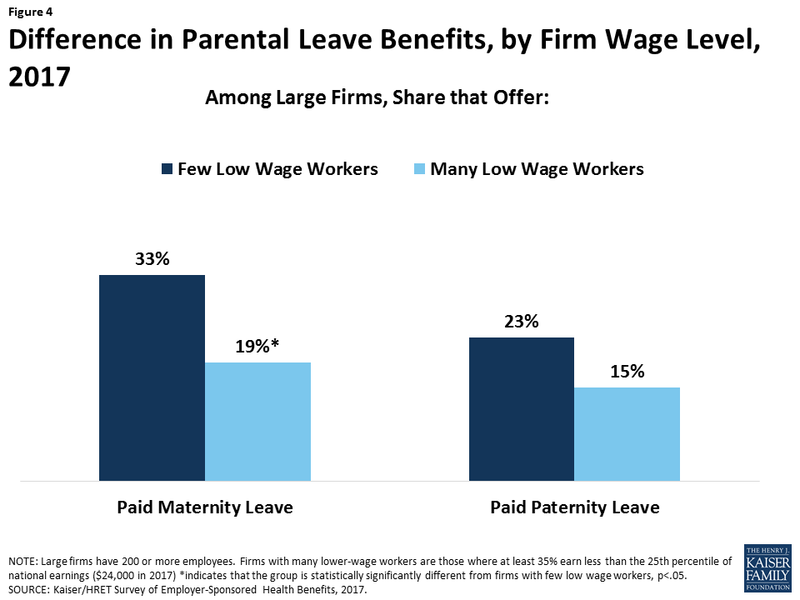 Among large firms, the share that offers paid maternity leave varies by firm wage level (Figure 4). Firms with many low-wage workers (at least 35% of workers earn less than the 25th percentile of national earnings) are less likely to offer paid maternity leave than firms with few low wage workers. There is no statistically different offer rate for paid paternity leave by firm wage level. 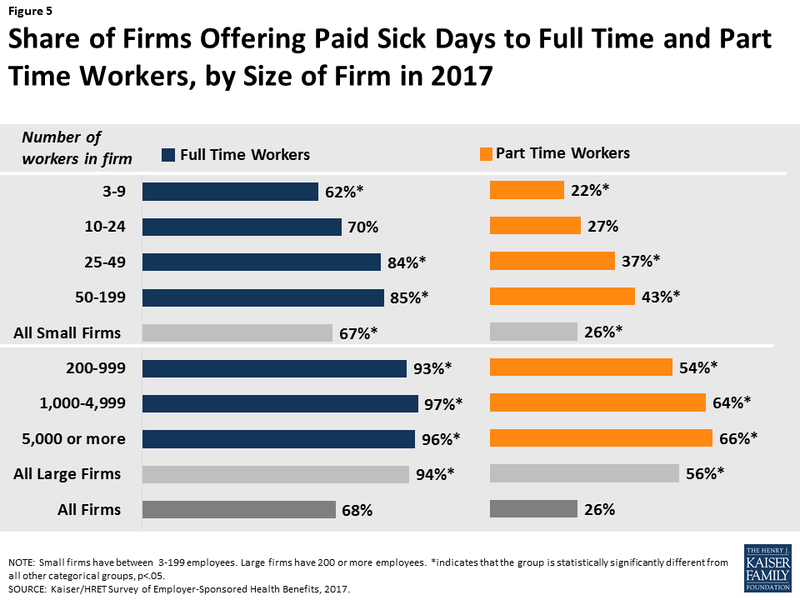 As a result, among non-federal employees, 87% work in firms that offer paid sick days to their full-time workers and 50% work in firms that offer the benefit to part-time workers. The lower likelihood of paid sick days for part-time workers has a disproportionate impact on women, who are more likely than men to hold part time jobs.16 Women are also more likely than men to care for children when they are sick and have to stay home from school. There are differences in availability of paid sick days between different kinds of firms. 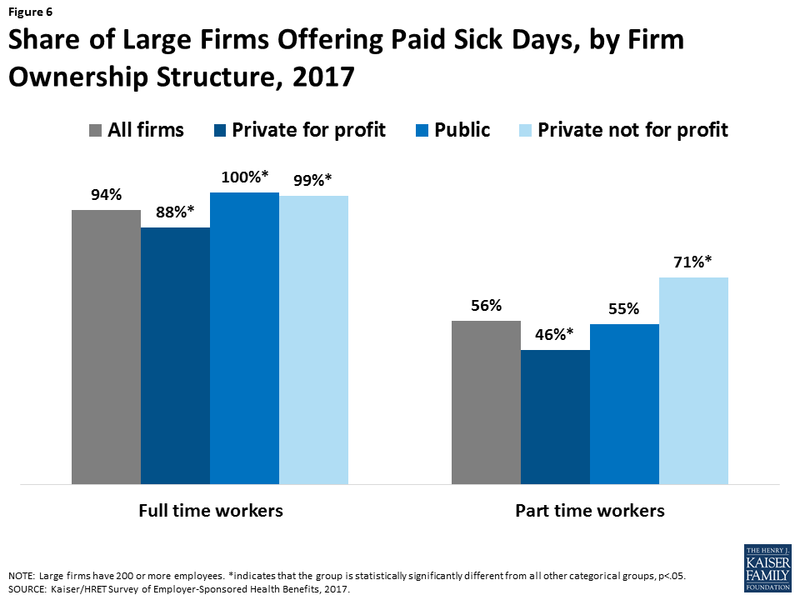 Large firms classified as private for-profit are less likely to offer paid days for their full time employees (88%) than public firms (100%) or private not-for-profit firms (99%). This is also the case for part time workers (Figure 6). This may be related to the presence of unions in firms, which also influences a firm’s benefits package. Large firms with at least some union workers are more likely to provide the benefit to their full time staff (98%), versus firms with no union workers (92%). 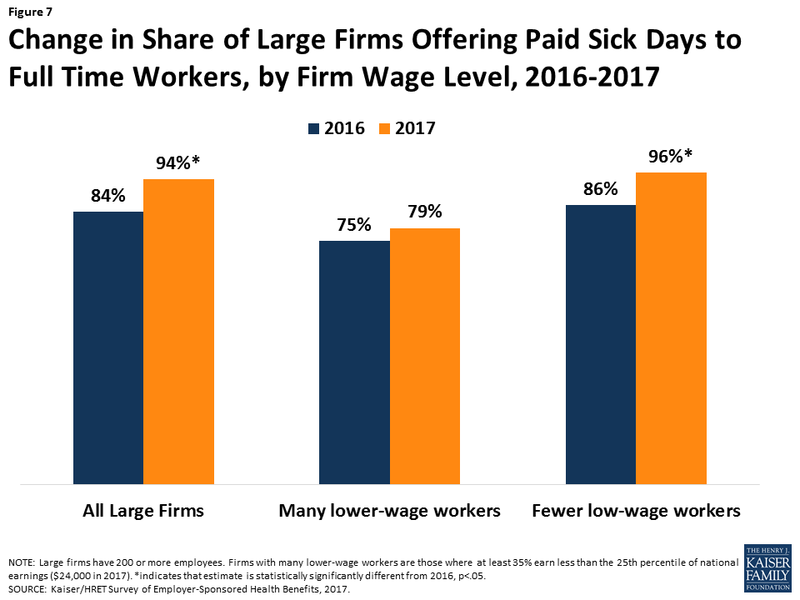 Between 2016 and 2017, the share of large firms offering paid sick days rose from 84% to 94%. The increase was greater among those who work in firms fewer low-wage workers (Figure 7). There was no change in share of firms offering paid parental leave. Paid leave continues to be a significant national and local national policy issue. President Trump has spoken about the need for supporting working class Americans, and forwarded the framework for a proposal to require states to offer six weeks of paid parental leave. At this point in time, the proposal lacks details and it remains to be seen whether Congress will take up this issue. Short of that, the movement for paid leave and paid sick days will likely continue to be centered on state and local policies or those voluntarily adopted by employers or negotiated through union contracts. Given that most people will need time off during their working lives to care for a personal or family illness, or for a new child, this issue will continue to be a salient concern for working families across the country in the years to come. Health Policy Brief: Paid Family and Medical Leave. Health Affairs, November 2016. United States Department of Labor, Women in the Workforce in 2010. Bureau of Labor Statistics. Employment Characteristics of Families Summary. April 20, 2017. National Partnership for Women and Families. Paid Family and Medical Leave: An Overview. March 2015. Abt Associates and Department of Labor. Family and Medical Leave in 2012: Technical Report. Hawaii, Maine, Minnesota, Washington, Wisconsin, Connecticut, Oregon, Virginia, New Jersey, Rhode Island, California and Washington DC have requirements for unpaid leave that are more extensive than FMLA standards. National Partnership for Women and Families. The Family and Medical Insurance Leave Act. February 2017. National Federation of Independent Business. Small Biz Voter Brief: Leave Policies. Office of Management and Budget. A New Foundation for American Greatness, Fiscal Year 2018. May 2017. The White House, Office of the Press Secretary. Fact Sheet: Helping Middle-Class Families Get Ahead by Expanding Paid Sick Leave. September 2015. National Partnership for Women and Families. Current Sick Days Laws. As of November 9, 2016. National Conference of State Legislators. Paid Sick Leave. As of February 8, 2017. Washington law takes effect Jan 1, 2018. Rhode Island House Bill 5413 signed September 2017 and takes effect July 1, 2018. Kaiser Family Foundation/ Health Research and Education Trust. 2017 Employer Health Benefits Survey. September 19, 2017. The 2016 Kaiser/HRET survey asked employers whether they offered health benefits to employees working fewer than 30 hours. National Women’s Law Center. Employment Fact Sheet. Part-Time Workers are Paid Less, Have Less Access to Benefits – and Two-Thirds Are Women. September 2015.